VR Zone has all the details about the Sapphire Pure Platinum A55V, a new budget motherboard based on AMD's A55 chipset. 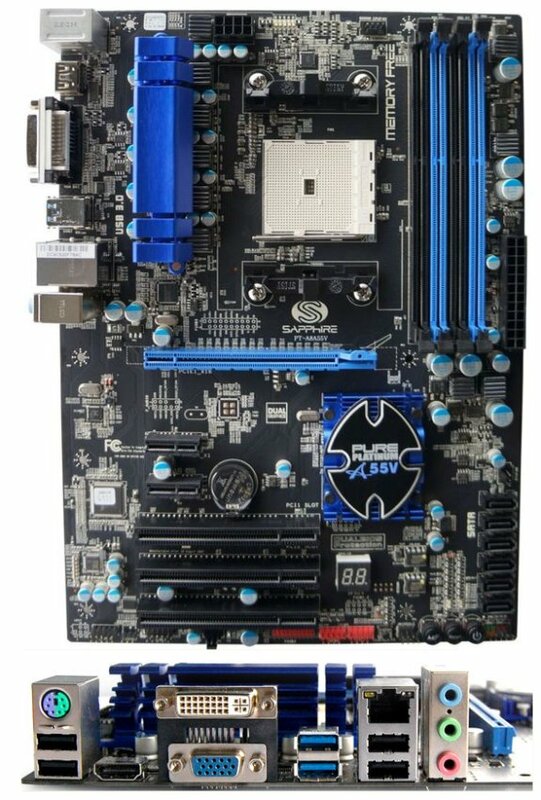 Unlike A55 boards from other motherboard makers, this model offers a rich set of features. It includes one PCIe x16 slot, two PCIe x1 slots, three PCI slots, six SATA 3Gbps ports, dual-BIOS, USB 3.0, etc. We're quite surprised to see features like dual BIOS, a POST80 debug LED, power, reset and clear CMOS buttons on a board at this price point. One feature we can't quite figure out is the inclusion of a front USB 3.0 pin header, yet we can only locate one USB 3.0 host controller and it appears to be connected to the rear USB 3.0 ports and the board isn't sharing the same PCB as one of Sapphire's other models. The rear I/O isn't overwhelming, but it's got enough ports for your average user with a PS/2 port, four USB 2.0 ports, two USB 3.0 ports, Gigabit Ethernet, 5.1-channel audio and a D-sub, DVI and HDMI port.